We’ve been getting a lot of emails and comments lately about planning a trip to Isle Royale National Park or Porcupine Mountains Wilderness State Park. So MichiganTrailMaps.com is having its first spring sale! Use coupon code Spring418 when you check out and save 25 percent on the guidebooks Isle Royale National Park: Foot Trails & Water Routes or Porcupine Mountains Wilderness State Park or the new waterproof map for Porcupine Mountains Wilderness State Park. To use the coupon go to our eshop. and then click “Have A Coupon?” in checkout. It’s that easy. The first time I visited Denali National Park was in 1980. I was living in Alaska and visiting a friend in Anchorage when one morning I jumped on a bus and by early afternoon was dropped off at what was then the park’s Visitor Access Center (VAC). Within an hour I had obtained a four-day overnight permit to the backcounty zone I wanted, watched the required orientation video, purchased the topos I needed and secured a seat on a shuttle bus (private vehicles are banned from the park) that would drop me off at my starting point; where the park road crosses the Toklat River. By the evening I was camped deep inside the park’s backcountry when Mount McKinley, bathed in alpenglow, suddenly burst out of the clouds. It was a classic wilderness adventure in one of the country’s great national parks with no pre-planning, no reservations, no waiting in lines, no hassles. But no more. As the longtime author of the Lonely Planet guidebook to Alaska, I made it to Denali often but with every trip those backcountry jaunts became more of an ordeal. Soon there was a reservation system for the shuttle bus seats. At the height of the summer that created something of a stampede at 7 a.m. when the doors of the VAC opened and people rushed the counter for the limited number of seats still available. Getting an overnight permit to zone, where only six to eight backpackers were allowed each day, was even harder. They were handed out a day in advance so you could spend days waiting for a zone to open up and rarely ended up with the zone you wanted to hike in. Visitors who arrived unknowingly in the middle of their Great Alaskan Trip, whether they were backpackers, RVers or a family just looking to camp a night or two inside the park, quickly learned that while they finally reached their dream destination, they weren’t going to see much of it before they had to move on. 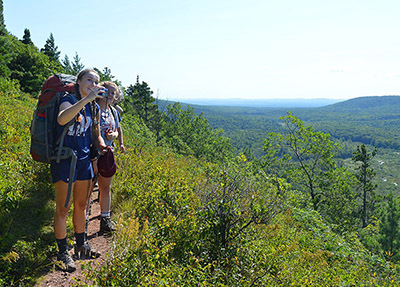 We have nothing like Denali National Park in Michigan but recently at the Porcupine Mountains Wilderness State Park, one of our top destinations for backpackers, a major change was implemented. 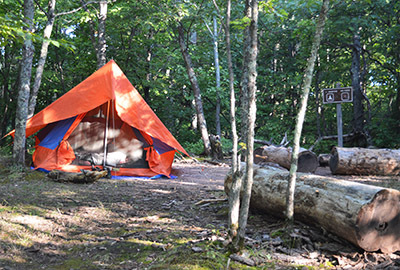 A backcountry campsite at Porcupine Mountains Wilderness State Park. The park has eliminated dispersed camping in the backcountry. You just can’t wander down a trail and pitch a tent anymore. To camp away from the road in this 60,000-acre park you have to stay at one of the 63 designated backcountry campsites. And for the first time you can reserve those sites in advance. The days of first-come-first-serve, self-registration and just pitching the tent anywhere in the backcountry for the night are gone. DNR officials claim that the new rules were necessary against a rising tide of visitors – the Porkies now draws more than 300,000 people a year with the vast majority arriving in the summer – to protect the park resources and help ensure a quality experience. The solitude of a wilderness that backpackers are seeking is often compromised by overcrowding. All you have to do is hike into Mirror Lake in the middle of July to realize that. True – if you visit in September or early October there will be open campsites in the backcountry. Or if you select less popular sites, like those around Government Peak, one or two might be available the day you arrive. But without an advance reservation good luck trying to obtain a site in the park’s more stunning settings like along Lake Superior, at the mouth of the Big Carp River or one of the four sites on the crest of the Escarpment where an evening is like camping on top of a mountain. Opinions about the new changes have been strong and spirited in the handful of hiking forums I follow. Often it’s spontaneous backpackers versus those who want the security of knowing where they’re going to camp every night, the ones who don’t mind meticulously planning their adventure and making reservations. Or as one backpacker put it: I don’t like it. One of the reasons I love hiking in the Porkies was the flexibility & lack of planning needed…you could literally look at the map as you were hiking and decide where to camp that night, depending on how far you felt like hiking. I get the reasons for needing it (overcrowding, etc) and I’m sure you planning-types will love it, I’m just not one of them. Backpackers on the Escarpment Trail. But what’s important to remember is this is not first time regulations and reservations have been implemented for backcountry crowd control in Michigan. For all practical purposes you need to reserve walk-in campsites along the popular Lakeshore Trail in Pictured Rocks National Lakeshore during much of the summer. Nor will it probably be the last time for such regulations. You can only wonder how long it will be before Isle Royale National Park or Sleeping Bear Dunes National Lakeshore in the case of North Manitou Island have to cap backcountry users due to overcrowding. What should worry us is not the prospect of planning our trips in advance. What should really concern us is the number of people who seek out the solitude and serenity of large, non-motorized areas is growing, but the number of places where they can find it has not. It’s a pretty safe bet that neither of those are going to change in the future. That’s what should worry you whether you’ve ever shouldered a backpack or not.